Seacrest Blvd, south of Woolbright Rd. What is now Boynton Beach, Florida, began with a group of settlers along the East Coast Canal banks in 1896. 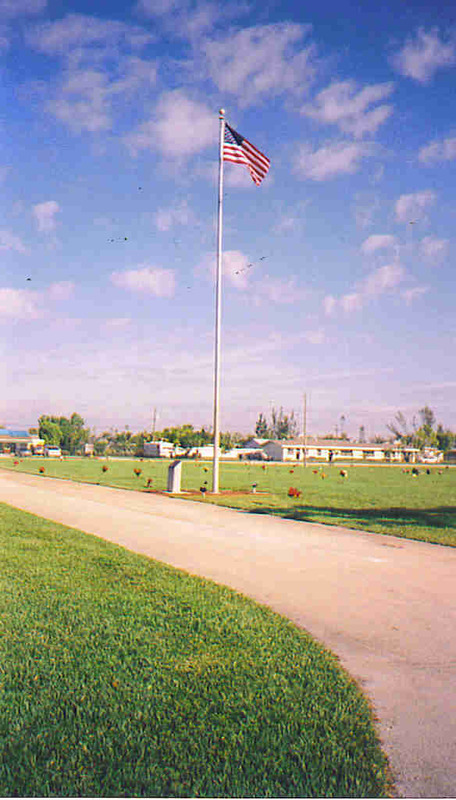 A town site, called Boynton, was laid out in 1898 by Fred S. Dewey on either side of the Florida East Coast Railroad. The original town site did not include the land to the south which became the municipal cemetery property. It may have been donated by Dewey himself. However, no record has been found of when the pioneers started to bury their dead at this location or why they chose this spot. 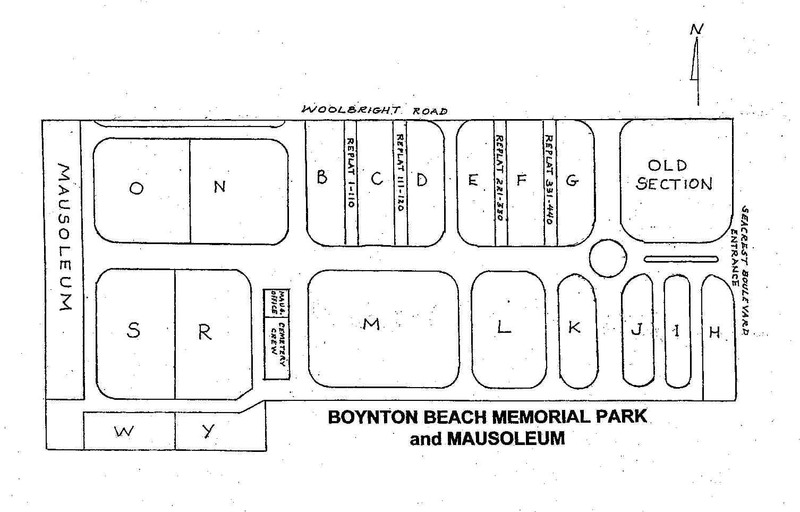 It is now called the Old Section of Boynton Beach Memorial Park. The earliest legible date on a tombstone is 1903. According to a WPA survey, the east half of the Old Section was for whites; the west half was for blacks. 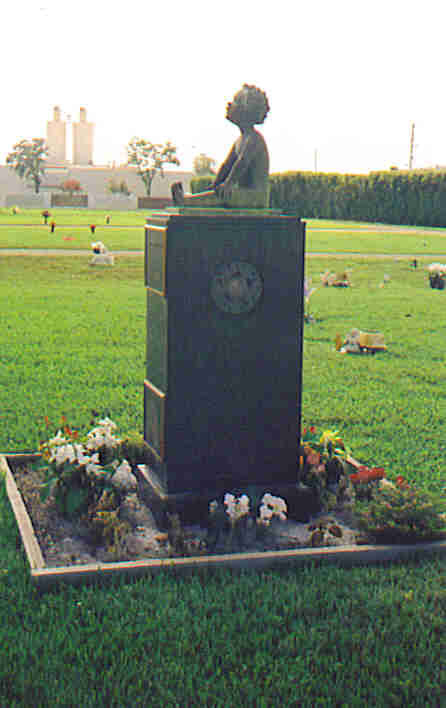 The Old Section is located in the northeast corner of the present cemetery. No lots are available for sale in the Old Section; the only burials allowed are in lots already owned. Many pf the markers are missing; many are illegible. The only way to locate a grave in the Old Section is by walking through it. In 1920, fifty residents voted to incorporate the Town of Boynton. At the time, the northern border of the cemetery was just a dirt road leading to the home of Thomas P. Woolbright. He asked the county to pave it. He was told that if he gave the right of way and helped build it, it would be named Woolbrioght Road. He accepted the terms and helped relocate graves in the path of the new road. Several children stood around watching while he and two helpers dug up graves. One was a baby’s wooden coffin that fell apart and a puff of wind took away everything but two little bows. The children ran off. In 1939, the City of Boynton Beach acquired the property to the west ogf the Old Section for nonpayment of taxes. In 1947, Blocks A, B, C, D, E, F, and G were laid out running along Woolbright Road from west to east, Block G bordering the Old Section. The city began keeping cemetery records. More land was platted for the cemetery in 1963 and Blocks H through M were laid out. Seacrest Boulevard became the eastern border. In 1974, still more land was needed and Blocks N through Y were platted for burials. There is no longer a Block A. Block L is for infants. Blocks P, T, and V were later sold for the mausoleum site. The cemetery now covers 12 acres and contains 8,650 remains and cremains, including the Old Section. Burials from August, 1903 through April, 2005 were recorded in this volume. To get more graves, driveways between Blocks B and C, C and D, E and F, F and G were eliminated in 1981. The spaces, called Replats, were filled with graves. There are four Replats. Even though blocks and replats are indicated by signs, locating a grave is difficult because there are no longer any walkways, driveways, or divisions between most of the blocks. Some graves are unmarked. Lots in each block start in the northwest corner with lot #1, run south to the end of the block, then start numbering again at the northern edge. The entrance to the cemetery is on Seacrest Boulevard and is always open. There are three gates on Woolbright Road, which are only opened for some funerals. For information, call Boynton Beach City Clerk’s Office at (561) 742-6060. The database was updated in early June of 2012 based on records at the City Clerk's Office but no attempt was made to check the information against headstones. The data for the period 2005 through may, 2012 is based strictly on their records. Veterans Monument, Block B, donated by local Am Legion, J. W.V. & V.F.W.